Click to Get a Skunk Removal Quote Now! The common striped skunk, from the weasel family, is prevalent throughout North America and of course, including the Halton Region and area we provide skunk removal services. They're excellent at digging and foraging for food, and very common to neighbourhoods throughout local towns. Breeding season is in February-March and with a short gestation period, baby season is May...at time when the skunk population increases. Skunks burrowing and feeding - often in and around residential areas - does conflict with humans. They look for places to burrow and most typically enter homes and buildings by entering any susceptible foundation openings. Feeding is made easy when garbage is left out by residents and businesses for municipal collection. Skunks are commonly known to make a mess of your trash! Skunks primarily seek out insects and grubs as a key part of their diet, which is another reason why they're a nuisance to home and business owners. They dig holes in lawns and gardens, which can cause extensive and costly property damage and ruin landscaping. Importantly, skunks may carry rabies and humans should definitely avoid any skunks showing very forward, aggressive behaviour, particularly during daytime hours. This may be an indication that they are rabid. 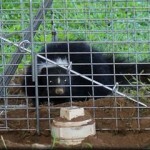 Confronting skunks should be left to animal removal and control experts. Our trained wildlife technicians can readily identify skunk damage and formulate a plan to catch them. Getting rid of nuisance skunks requires some effort and our expert know-how. If they've entered your property, we identify evident or potential entry points and ensure that they're out before we close off these areas to prevent skunk re-entry. We will also provide you tips on how to dissuade skunks from being attracted to your property!